Things appear far less rosy a week and one-half later. The Commerce Department’s growth figures for the final quarter of 2014 (released Thursday) reveal a slowing economy: 2.6 percent for the fourth quarter, compared with 4.6 percent in the second quarter and 5 percent in the third. That places real GDP growth for 2014 at 2.4 percent. The “breakthrough year” seems to be but a marginal improvement over 2.2 percent (2013) and 2.3 percent (2012). The Commerce Department also released the figures on the seasonally adjusted homeownership rate: 63.9 percent, the lowest level in 20 years. Well, there is a reason for calling this “middle-class economics” just like there is a reason for calling 2014 a “breakthrough year.” Unfortunately, the reason is not grounded in the empirics. Critics of the President’s State of the Union address noted it did little to promote bipartisanship. Yet, it has already stimulated bipartisan agreement on one of the President’s education proposals. “I am sending this Congress a bold new plan to lower the cost of community college—to zero. One detail that failed to make it into the State of the Union address: The funding for the program would come by effectively killing the 529 college savings accounts, that exempt earnings from taxation if used for educational expenses. President Obama, facing angry reprisals from parents and from lawmakers of both parties, will drop his proposal to effectively end the popular college savings accounts known as 529s, but will keep an expanded tuition tax credit at the center of his college access plan, White House officials said Tuesday. The decision came just hours after Speaker John A. Boehner of Ohio demanded that the proposal be withdrawn from the president’s budget, due out Monday, “for the sake of middle-class families.” But the call for the White House to relent also came from top Democrats, including Representatives Nancy Pelosi of California, the minority leader, and Chris Van Hollen of Maryland, the ranking member of the Budget Committee. Although this means of funding the community college proposal seemed particularly tone deaf, it does illustrate that bipartisanship is possible when protecting tax expenditures. Imagine if reformers focused on even larger tax expenditures (e.g. the $212 billion exclusion of employer-provided health insurance, the $176 billion expenditures for pensions and 401(k)s, or the $101 billion deduction of mortgage interest)? A new era of bipartisanship might bloom. Related: See Josh Kraushaar in National Journal for an interesting piece on the SOTU and the implications for Hillary Clinton 2016. The Hagedorn, Manovskii, and Mitman working paper on the effect of unemployment insurance (UI) on employment has been getting a lot of press lately. In brief, they find that the end of the federal unemployment insurance extension accounts for about 1.8 million new jobs in 2014. In summary, if you are skeptical of the empirical strategy and theoretical justification of the literature saying the minimum wage has no negative employment effects, you should also be skeptical of the empirical strategy and theoretical justification of the new paper showing that unemployment insurance has big disemployment effects. If you like the Dube et al. minimum wage work, you should like the Hagedorn et al. UI paper. How many wonks are intellectually honest enough to adopt one of these two, ideologically inconvenient pairs of positions? Even a small win for rolling back the state is so seldom observed that it’s worth mentioning when one happens: the medium-sized town of Portsmouth, New Hampshire (one of the most “progressive” municipalities in the state) has abolished all taxi regulations and shut down its Taxicab Commission. Correction: the regulators voted to abolish themselves, but the city council must approve their recommendation before it comes into effect. Yes, it is tonight. Those of us who actually follow these things can predict that many of the initiatives that will be announced by President Obama will have little significance with respect to policy because they will never make it through Congress. Priscilla Alvarez (National Journal) has an annotated version of the 2014 SOTU address, reviewing the fate of last year’s policy wish list. I must admit, I was actually surprised by how many of the items lived beyond the speech. Last week Attorney General Eric Holder announced that the Department of Justice would be suspending its adoption of state civil forfeiture cases through its “Equitable Sharing” program. To review, civil asset forfeiture is the procedure by which law enforcement seizes property suspected of having been associated with a crime, and then auctions it off and uses the money for its own purposes. Under federal law, asset forfeiture is easy: the agency must simply show by a preponderance of the evidence that the property was associated with a crime, and then the owner bears the burden of proving her innocence. Under the Equitable Sharing program, the Department of Justice “adopts” state cases in states in which forfeiture laws are stricter, thereby implicating the weaker federal standard, then shares up to 80% of the proceeds of these forfeitures with state and local law enforcement. The system creates perverse incentives for seizing the cash, vehicles, and businesses of innocent people, as last year’s blockbuster investigation by the Washington Post revealed. Moreover, the Equitable Sharing program intentionally circumvents state law. The Institute for Justice’s 2010 study Policing for Profit showed that states with stricter civil asset forfeiture procedures saw substantially greater Equitable Sharing revenues.
. . . (1) seizures by state and local authorities working together with federal authorities in a joint task force; (2) seizures by state and local authorities that are the result of joint federal-state investigations or that are coordinated with federal authorities as part of ongoing federal investigations; or (3) seizures pursuant to federal seizure warrants, obtained from federal courts to take custody of assets originally seized under state law. According to the WaPo story, only 57% of Equitable Sharing proceeds came from state-only investigations, so the new policy should cut payments to state and local agencies by about half. When it comes to big forfeitures, the new policy creates an obvious incentive for local law enforcement to bring in a federal investigator to create a pretext for adoption. Moreover, many of those forfeitures that are no longer adopted will still be pursued under state law, simply with a higher evidentiary threshold in many cases. Thus, the total amount of civil forfeiture that occurs in this country can be expected to drop by only a small fraction of the current annual average total. To get a better sense of how this policy change will affect asset forfeiture in the states, I will present some numbers from the new asset forfeiture dataset that we are compiling for the fourth edition of Freedom in the 50 States. We have data on Equitable Sharing proceeds by state from Fiscal Year 2000-01 to Fiscal Year 2012-13, as well as detailed information on state standards for forfeiture. 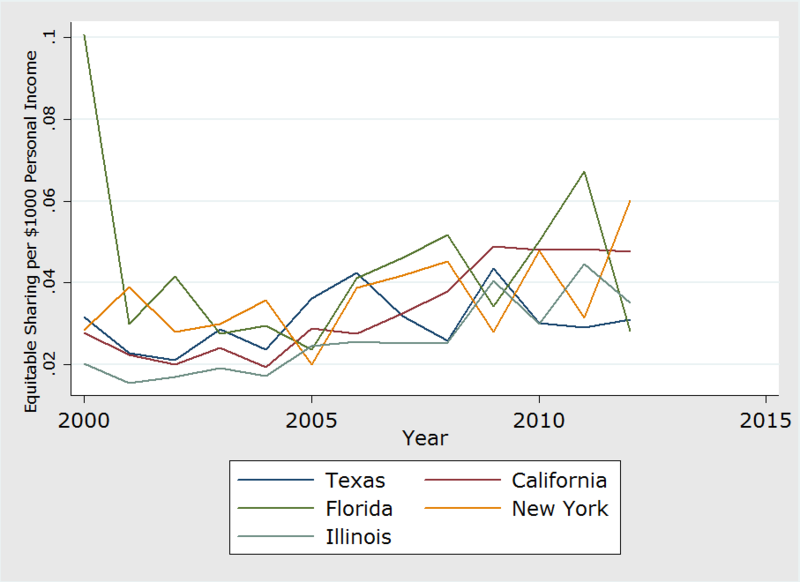 The following time-series chart shows Equitable Sharing revenues per $1000 of state personal income for several large states: Texas, Florida, California, Illinois, and New York. These data exclude a massive, one-time payout to New York agencies for the Bernie Madoff case. As the chart shows, Equitable Sharing really began to ramp up in 2006-07. By 2012-13, these five states combined for $228 million in forfeiture revenues from the federal government. For each of the last four years, California was first or second among these five states in forfeiture revenue as a share of the state economy. Probably not coincidentally, California has some of the toughest procedures for civil forfeiture in the country. In the U.S. as a whole, Equitable Sharing forfeiture revenues totaled $486 million in FY 2012-13, more than double the total of 2004-05. We don’t know just what the total value of assets forfeited in the country is, because states and localities don’t often keep track of the data. Moreover, the Equitable Sharing program includes proceeds of criminal as well as civil forfeiture (criminal forfeiture upon conviction is much less controversial). But from the states for which we do have data, it appears that, at least in the early 2000s, total assets forfeited through state law amounted to about 20-50% more than what the states got from Equitable Sharing. Those figures undercount the losses to victims of forfeiture, because agencies get, at best, market value for what they seize. So it’s quite possible that each year, more than $1 billion in value is taken from property owners through civil asset forfeiture. With any luck, Holder’s decision will inaugurate a new round of forfeiture reforms at the state level, as legislators realize that they once again have the power to set policy for their own officials. Catalonia will hold a de facto independence referendum through regional elections on September 27, 2015. This one will have “real” effect, unlike the 9N, because the Catalan independence parties would form a unity government and set up the institutions of an independent state, ultimately declaring independence at a date yet to be announced. There will be advanced regional elections in #Catalonia on 27 September that will function as plebiscite & de facto independence referendum.